In February, 2018. Matthew Hartwell at Radwell's Indiana location received another call, this time from Hurley Medical Center in Michigan. Hurley Medical Center had the same situation that Siemens had in October 2017. 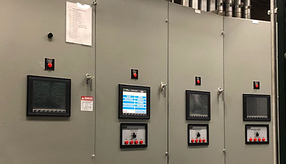 Just like the Siemens service call, Hurley Medical Center was having issues with a series of switches that automatically switch the facility's power to their generators in the event of a power outage. In most facilities, these parts would be important. In a medical facility, they are of critical importance. After Radwell scheduled the service call, Hurley informed team members at Radwell Indiana that they had a 2nd screen stop working. Radwell team members went ahead and ordered parts needed for the repairand Eric Dupont had the foresight to order double the number of parts to cover every possible scenario. Eric also asked Hurley to send photos of the setup so preparation was proactively covered. The service call was scheduled for September 11th and by the time Team Radwell arrived in Michigan the Monday evening prior, Hurley advised that a 3rd monitor was now non-operational. When Radwell was first contacted for this repair, Hurley only had one display go out. The urgency came about when a second display became non-operational as well. By the time the team from Radwell arrived on site, 3 out of 4 displays were non-operational and the 4th one was very dim. Based on the history of the 3 dead displays and the frequency of failure, it was only a matter of time before the inverter or bulbs on the 4th display would fail. By being proactive, Eric Dupont had enough parts to be fully prepared for this service call, even with the additional repairs that were needed. When the team arrived at Hurley Medical Center, they were taken to a repair area where a portable table was set up, complete with an ESD mat for the displays to be repaired. The plan of action for Team Radwell was to repair display #3 which would have the program from the main transferred to it. This was to insure there was the least amount of downtime possible. The program from display #3 was backed up and the display was removed from operations so repairs could commence. Once repairs were completed, the display was installed back into position #3 to verify functionality. Once functionality was verified, an onsite tech started the process of backing up the main program for the transfer to display #3. This leaves a 5 to 10-minute downtime during which the old main is removed and the new main installed. Display #3 was then removed, the main display shut down and the new main installed and operation verified. The original main display was repaired next which would replace display #3 after the program was uploaded. The main display repair was completed and functionality verified. This left 2 displays running with full display and basic operation verified. At this point there were two remaining generators left, labeled 1 and 2. Display #1 had a backlight and was the only display out of the four that had a backlight that was barely operational. This display was repaired as well since the display was very dim and history indicated that it would most likely fail soon. 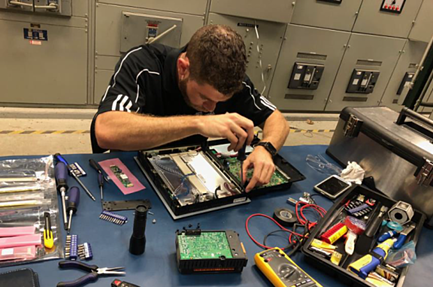 No programs needed to be transferred for the remaining two displays as the positions do not have to be swapped out and simply came down to repair and reinstallation. A decision was made to repair display #2 first since the backlight was completely out. Display #2 was removed and repairs performed and completed. It was reinstalled, and basic functionality verified. At this point three fully functional displays were up and running and only one display remained to be repaired. Display #1 needed preventative maintenance. Based on recent history of the displays, it was not a matter of IF it would fail but WHEN it would fail. Display #1 was removed and repairs were performed and completed. The display was then reinstalled and its functionality was verified by the onsite technician. There were now four fully operational displays with backlights in place. The final process involved a test to verify full function of the generators. 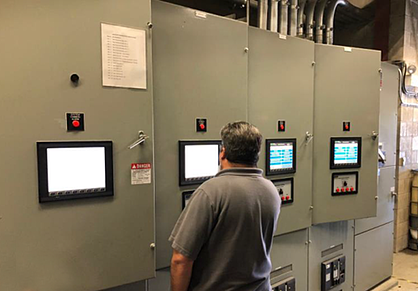 At this point Radwell team members were done and the onsite technician and local maintenance staff commenced testing to verify everything was running as it should. The ability to go above and beyond for a customer is important. To be able to do so in a stressful situation while working in tandem with others on site, is even more important. To accomplish what others could not to keep a customer's operation up and running is a true success story. Whether onsite with a customer or in one of the many Radwell locations, accomplishing what initially looks impossible is the difference between choosing a solution or choosing the best solution.